Where are you from? Austin, Texas born and raised. If you ever go to Texas, it’s the place to visit. I’ve been in Boston for six years. I came up to go to Tufts and just decided to stay. What did you study? Child and human development. Do you do work in that field now? Yes, I work as a supervisory preschool teacher. I teach and I supervise the staff in a preschool program. It’s my love, it’s my pride and joy. What pronoun do you like to go by? They/them series. I get all of the pronouns under the sun, but the ones that I go by is they/them. Do you identify as trans? I identify as trans non-binary, so I’m not really in the box of female and not really in the box as male. I mix them up a little bit or not at all. Sometimes I’ll identify as one and sometimes I’ll identify as the other. That’s the fun of being non-binary, it’s what I construct, what I put together. Today is baggy jean day, but tomorrow might be like booty short and painted toe day. Do you use your wardrobe to express if you’re feeling more masculine or more feminine? Yes, I try to be really intentional about wearing the first thing that comes to mind. If I don’t wear that, it’s typically because I’m being complicit with looking like what everyone around me wants me to look like. It’s constant work to be aware of why I’m making the choices that I’m making; are they for me or are they for the person sitting next to me and for their comfort? That’s so hard to know. It’s really hard and it’s a daily job. 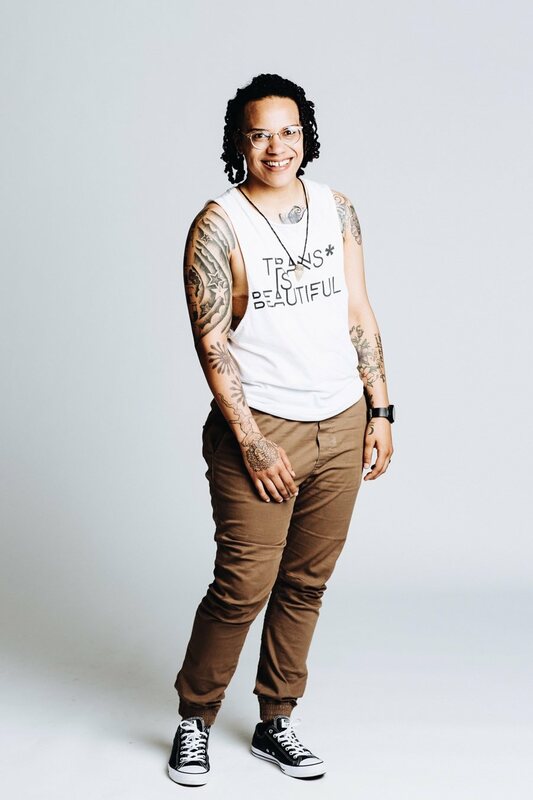 This morning I was feeling quite beautiful and quite trans so I wore my “Trans is Beautiful” t-shirt by Devin-Norelle. Do you mind talking about your trans journey? Sure. Did you identify as a woman or as a man when you were growing up? Having the terms that I have now, and knowing that it’s ok to just be the way that I am, I grew up identifying as a gay woman in particular. If you were to ask me now, I identify as queer, I’m open to anything and everything. I try to stay away from labels, but words can help me, like non-binary and trans, those words help me express and explain who I am. But I try to stay away from what that means or what box that fits me in. Did that take a while to get to for you? Sure, it’s constantly evolving, like every every every day. I just started identifying as queer. I stood away from identifying from any kind of sexual orientation because no term really fit who I was. I think that’s the problem, even in a world where I know that we shouldn’t work to fit, people still want to fit into something. If only to have a community, right? As big of a community that we are, we do separate ourselves into sub communities and sub groups. It was really important for me to fit, but now what I’m working on is fitting inside of myself, getting to know me. I’m always learning. It’s the most scary because people want to know what I am, but it’s the most fun because I construct it, I put it together, it’s what I say it is. You have your version of me just by looking at me, but I try to give you the version of me that I created, rather than the version that everyone else has created. Its amazing how transformative you can be. Just by using superficial aesthetics, you can change how you present to the world. That must be so freeing and so powerful but also – So vulnerable. The most freeing, the most healing moments that I’ve experienced have also been the most vulnerable. But who am I doing it for? We’d rather cater to the comfort of someone else, than our own comfort. Do your kids have a lot of questions for you? Oh sure, I mean the one question I get a lot is, “are you a boy or are you a girl?” I’ve gotten a lot of love for the way that I approach those questions. I just say no, but I am a person. It kind of stops there. I want to entertain these questions because I want to know what is informing them, what the cues are, what advertisements, what cartoons, what is informing them about me? Now’s my chance to inform them about me. These three, four and five year-olds are coming from a good place of just wanting to know because they’re seeing somebody or something that they haven’t really seen elsewhere. I find it really awesome to be a trans, non-binary, black preschool teacher. Tell me about your tattoos. My new home is Lucky’s tattoo shop in Cambridge. They just opened up in the new year. It’s trans owned and queer run, so it’s a home away from home. This piece on my arm is new, I just got it finished last week. There is a story behind every single piece that I have, this is the most significant to me right now. I have a really great friend, Rashad Malik Davis, who is a renowned children’s book author and illustrator, we went to Tufts together, and I reached out to him. I said, hey I’ve been through some really traumatic things in my life and I would like that to get pulled into a piece. He’s a gay black man who does amazing work and outreach with kids. It was really scary because it’s a hand tattoo and there’s no way to cover it up. I had to talk to four different artists because the first three wouldn’t do it because they didn’t want it to be the reason that I couldn’t get a job. I was like there are other reasons why I couldn’t get a job – I’m living while black, I’m also trans, this will be the last thing that they write down.